“Brandon is the best kid in school, everyone loves Brandon.” How do we know? Brandon said so. Read on for more hilarious yearbook sayings. People make relationships too complicated. Really, we all have much more in common than we think, as shown by this adorably geeky pick-up line/yearbook quote. Need more giggles? Check out these 40 photos you won’t be able to stop laughing at. It’s hard to draw on tough experiences that made you stronger for an inspirational quote when you haven’t lived much life yet. So instead this student decided to try to empathize with a very different person. It worked, we guess? For anyone who’s ever taken an awful school picture and then died a little when they realized it would be memorialized forever in their yearbook—he feels your pain. Take your laughter on the road with these 18 funny road signs worth stopping for. Channeling her inner Dobby, Megan’s quote shares how she got her gift of a sock, er, diploma, and is now free from the slavery of school. Run free, Megan! On the other hand, these J.K. Rowling quotes will motivate you through any slump. Any kid who’s been saddled with an overly “unique” name will immediately understand this yearbook quote—one she probably has to say over and over again every school year. Life is tough. But you’re toughter. Thougher. Tuffer? One boy attributed his misspelled yearbook quote to John Wayne but we’re guessing this ironic statement was all his. It seems someone slept through English class! Wait, does Mother Hubbard know about this? Three classmates, all with the last name of Hubbard, used their yearbook quotes to put the question about their name to rest once and for all. Clearly, they were tired of being asked if they were siblings or cousins! For more family humor check out these 18 stories that show just how funny parenting really is. Diane C. loves Chewbacca so much that she learned Shyriiwook, his simple yet beautiful language, and used it to say… well, we don’t know what… in her yearbook. Tyler B. shared her love of both humor and toxic gas in a yearbook quote that will have her friends rethinking all their interactions, especially that New Year’s Eve party last year. But does Brandon like everyone else? Everyone says this about Brandon, at least according to Brandon. Brandon has very good self-esteem. Like this? You’ll also want to check out the 75 funniest quotes of all time. Best friends or best enemies? Thanks to their last names, friends Steven E. and Kristian F. knew their pictures would appear side by side in the yearbook and decided to take advantage of it! The whole cake? The whole pan of lasagna? We’ll never know what exactly Charlie M. ate but clearly, it was epic enough that he wanted to memorialize it in his yearbook. Check out these 10 product reviews that will have you cry-laughing. More than one person chose to use this quote to prove to their future kids that they were smokin’ hot when they were younger. Flaunt it while ya got it? For more teenage giggles, check out these funny-awkward first kiss stories. Nobody wants to see their classmate and friend end up on the mean streets so thank heavens Justin D. saw the genius of sidewalks and wasn’t afraid to use them. It must be hard being mistaken for the funniest kid in school when you’re really just trying to insult people—at least it was for Alixandria G. Does this mean we can’t laugh at this? Check out our favorite funny political quotes (and insults). But plus ten points for creativity! One boy decided to make his classmates laugh and his teachers cry with his very un-academic yearbook quote. Michael W. really just wanted to remind people to be their very best, or someone else’s very best. May we suggest Batman? Hey, it’s good to have goals! Then why are you in the yearbook? Ever wonder what would happen if you just showed up at another school on their picture day? Apparently, you get in the yearbook too! At least it worked out that way for Danny B. Or maybe he’s a spy in training. 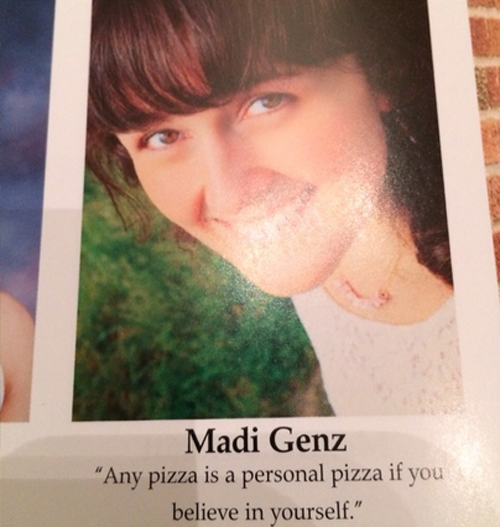 There’s nothing worse than letting perfectly good pizza go to waste, as shown in Madi G.’s favorite quote. It’s not just overestimating your stomach capacity: Check out these 41 ridiculous things people actually believed as kids. Don’t you technically have to live before you can die? We think what Wendy G. meant in her quote was that not every person truly lives their life to the fullest but it kinda sounds like she just doesn’t understand how the circle of life works. How did this one make it past the editors? And Sebastian M. shows why he was nominated as “Least Likely To Get A Date”. Cleanse your (mental) palate with these funny mom quotes that will have you cry laughing.